FINALLY...Twins and Triplets come with instructions! Well...almost! 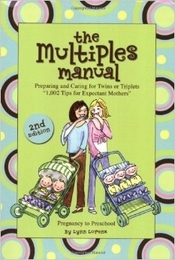 While nothing can fully prepare you for the birth of your multiples, THE MULTIPLES MANUAL is sure to help - it's guaranteed to simplify your life, save you time, and even save you money! Full of information on what every mother should know before, during and after the birth of her multiples.